The Kanga Kid is the world’s smallest multi-task compact skid steer loader, with a special range of attachments that completes the toughest jobs quickly and easily. 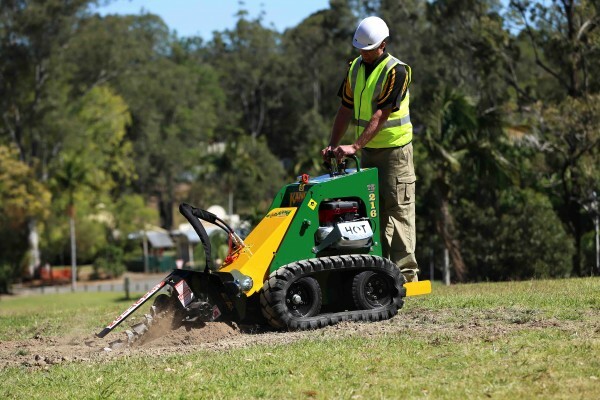 With residential site access becoming increasingly smaller, the 2 Series is the popular choice among landscapers, pool installation, builders, contractors, electrical and many more. 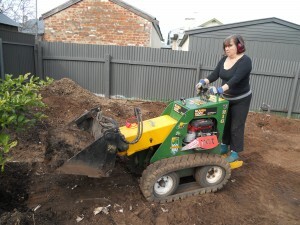 My original ‘need’ for a mini loader was to shift the impact of landscaping from my body to a machine! 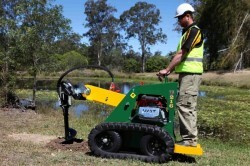 So we purchased our first Kanga for lawn and paving installs. The choice of a stand on skid steer was it’s muscle, ease of use and maneuverability. 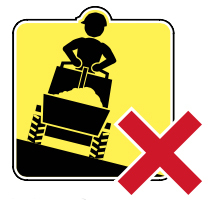 There just wasn’t another machine that came close to this option for our work. 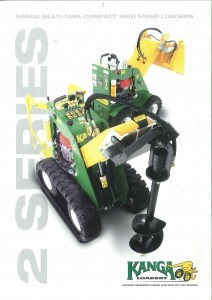 All machinery needs engineering strategies to place the least possible load and stress on its components. 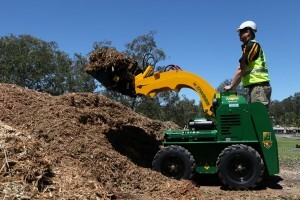 Not all skid steer loaders are engineered the same. 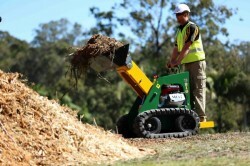 Kanga Loaders are engineered to perform and last. Other manufacturers still mount their wheel motors by bolting them through the sheet metal of the chassis without supporting the wheel motor in a manner that will last the test of time. 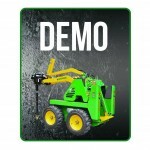 Hydraulic Design – Allows minimal training to get the operator to maximum efficiency for attachments. 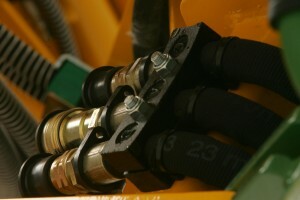 The mercury switch sensor detects low oil level and immediately shuts off to protect the engine. 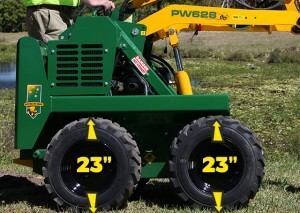 Never misunderstand the importance of wheel/Tyre combinations on earth moving equipment. Often this critical point is overlooked by the prospective buyer/operator. 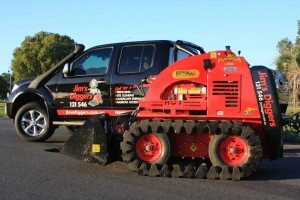 Kanga has addressed the critical importance of wheels and tyres on earth moving machinery. 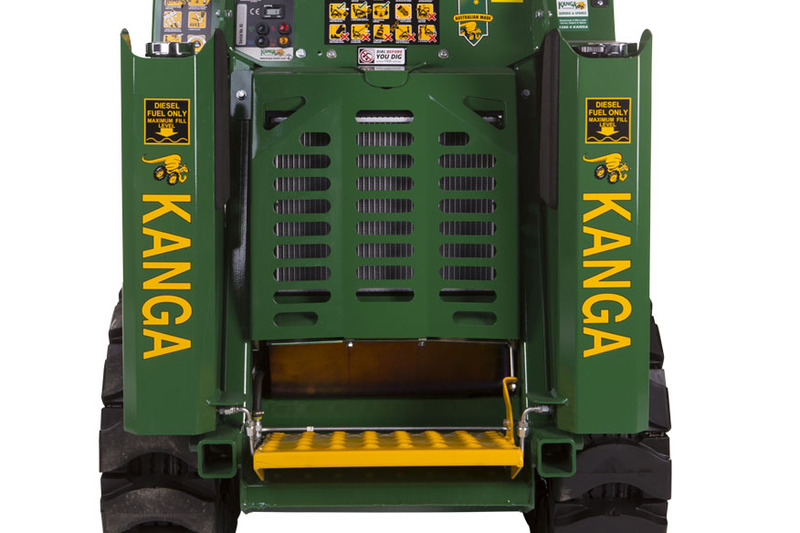 Each Kanga is designed and manufactured for durability, reliability, productivity, less environmental impact and most importantly a long life! 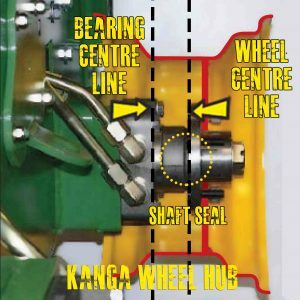 Kanga also maintains an extensive inventory of spare parts that supports our current product range as well as some legacy parts, which are up to 30 years old. 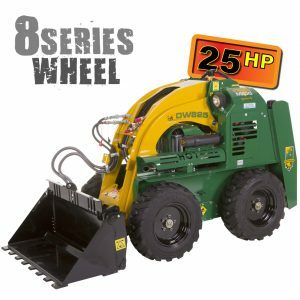 With over 5,000 parts on the shelf you can be assured fast acccess to spare parts keeping you on the job! 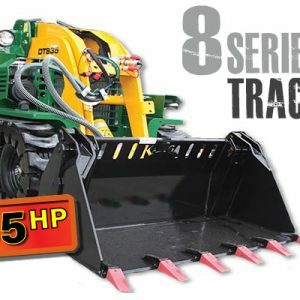 Clear obstacles in uneven terrain, such as gutters, mud, and foreign objects. 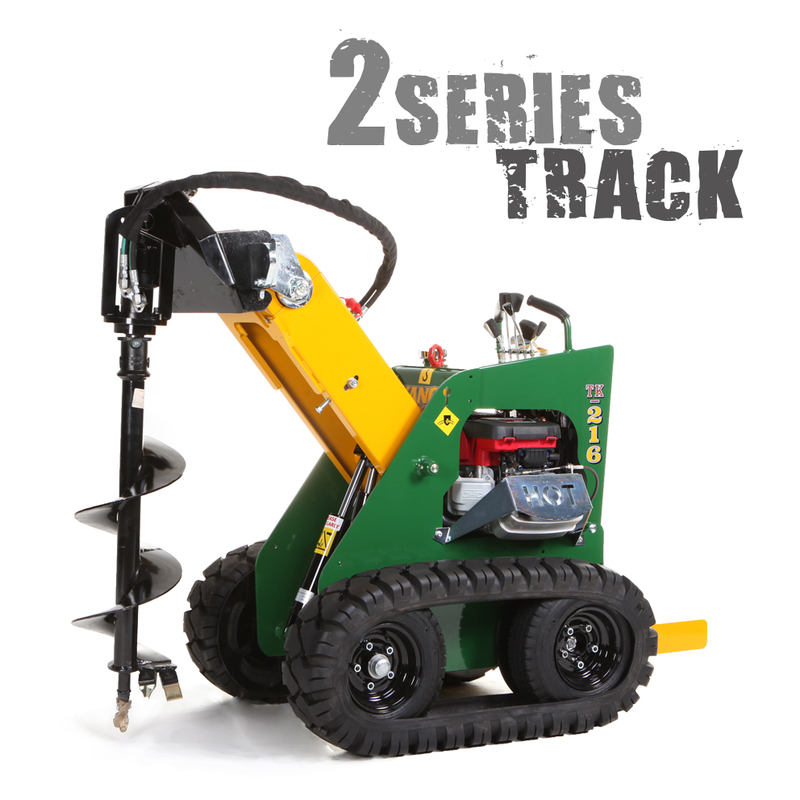 The greater angle of departure allows easy access on all ground contours and minimizes operators exposure to hazards. Generous bucket rollback coupled with high ground clearance provides optimum stability and allows easy filling and safe transportation without spillage due to the lower centre of gravity. 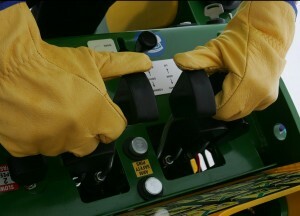 The larger operators platform has been ergonomically designed so that the operator can maintain a wider, neutral stance which improves safety and fatigue reduction. 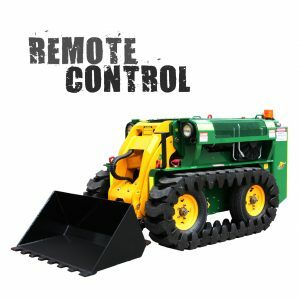 The operator is enclosed within the operating platform. Bump protection bars on tanks also provides additional support. 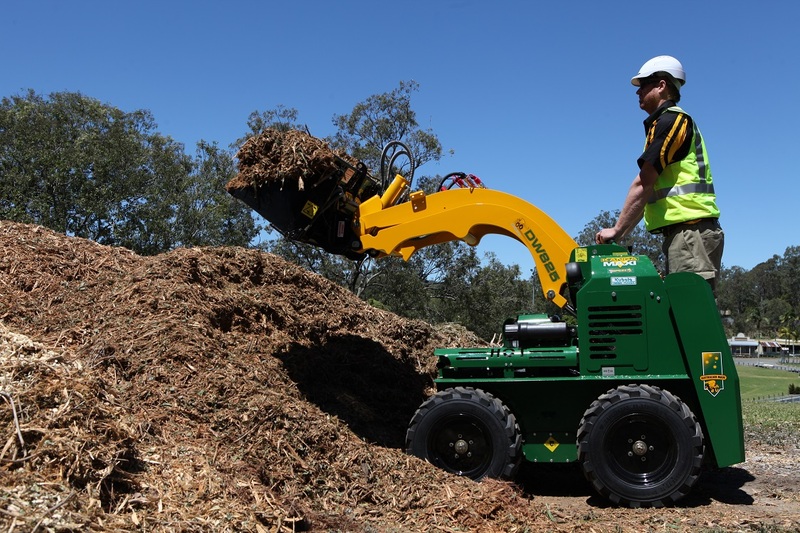 Whether you need to adhere to corporate branding guidelines or simply want a “one-of a kind” Kanga mini loader, our custom paint option is affordable and will have everyone turning their heads. Show off your favourite footy team or sports car, our specialised paint team and graphic designers are happy to work with you. 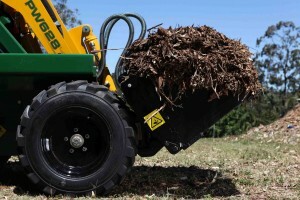 Kanga’s bucket ensures safe, fast, easy operation without the danger of load spillage over the operator. 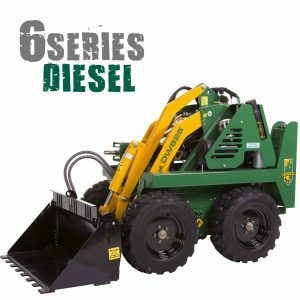 The self-levelling feature also offers superior control allowing the operator to fill the bucket to it’s maximum capacity – making it the only mini Loader in today’s market with this feature. 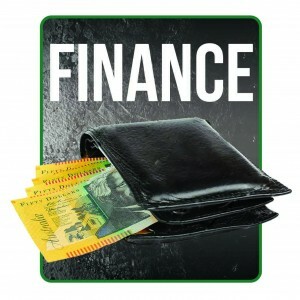 Regardless of the job at hand, Kanga Can! Our highly versatile piece of machinery takes on a wide variety of tasks, turning hard work into easy business. 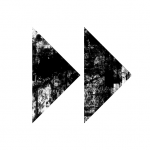 With an artisan approach to manufacturing, Kanga can be highly responsive and create a tailored package to suit each businesses needs in this diverse market.